So many books have been written about management style. 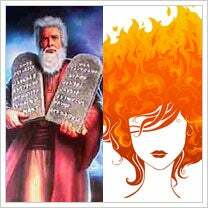 Should you manage like Moses? Or, should manage like a kindergartener...or like your hair's on fire? In a recent post on his blog, business-plan guru Tim Berry of Palo Alto Software and Bplans.com says there are really only two basic management styles: You're either managing by a set of rules and policies you've come up with or you're managing on a case-by-case basis. In other words, by the book, or by the seat of your pants. Both approaches have their shortcomings. While rules can bring consistency, being too rigid about rules or having too many rules to follow can cause you to miss opportunities. "Rules and systems establish order and simplify processes, but they also cut into flexibility, and disempower common sense," he writes. Berry's middle ground is to create general guidelines that empower workers to use their own common sense within that framework. In other words, you should foster an environment that not only has rules at the 10,000-foot level, but also allows for individual decision making down on the ground. Personally, I tend to be a planner type who likes consistency and rules. But as time goes by, I find myself trying to bust out of that to make more calls based on the specific situation. My husband is a real improviser in his decision making, and I'm often impressed with the solutions he comes up with on the fly. I'm striving to be a bit more like that. Maybe I'm trying to have the best of both philosophies -- a plan to fall back on, while still retaining the flexibility to deal with emergent issues. I'd like to develop the ability to trust my gut a little more. What's your management style? Leave a comment and let us know.